Your inner history buff will appreciate Iglesia Santa Elvira and Ambrosio Cave. Explore hidden gems such as Shark Diving and Varadero Street Market. Explore the numerous day-trip ideas around Varadero: Matanzas (Bellamar Caves & Cayo Blanco). The adventure continues: identify plant and animal life at Varahicacos Ecological Reserve, kick back and relax at Varadero Beach, Head underground at Saturno Cave, and tee off at Varadero Golf Club. For reviews, traveler tips, maps, and more tourist information, read Varadero trip generator. Dublin, Ireland to Varadero is an approximately 21-hour flight. Due to the time zone difference, you'll gain 5 hours traveling from Dublin to Varadero. Prepare for much warmer weather when traveling from Dublin in November: high temperatures in Varadero hover around 32°C and lows are around 21°C. Cap off your sightseeing on the 17th (Fri) early enough to go by car to Cienfuegos. Do some cultural sightseeing at Delfinario de Cienfuegos and Jagua Castle. Get outdoors at Rancho Luna Beach and Guanaroca Lagoon. There's lots more to do: pause for some serene contemplation at Catedral de la Purisima Concepcion, make a trip to Cementerio la Reina, admire the striking features of Palacio de Valle, and wander the streets of Punta Gorda. To find maps, where to stay, and tourist information, refer to the Cienfuegos vacation planner. Traveling by car from Varadero to Cienfuegos takes 3 hours. Alternatively, you can drive; or do a combination of bus and train. In November in Cienfuegos, expect temperatures between 34°C during the day and 22°C at night. Wrap up your sightseeing on the 19th (Sun) early enough to take a bus to Trinidad. 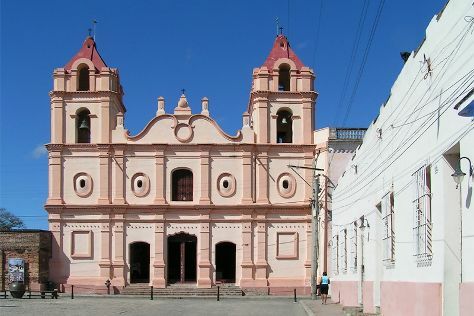 Your inner history buff will appreciate Iglesia Parroquial Mayor del Espiritu Santo and Valle de los Ingenios. Take a break from the city and head to Topes de Collantes and Parque el Cubano. Next up on the itinerary: trot along with a tour on horseback, see the interesting displays at Trinidad Architecture Museum, kick back and relax at Ancon Beach, and stroll through Parque Central Cespedes. To find maps, other places to visit, ratings, and more tourist information, read our Trinidad vacation builder. Traveling by bus from Cienfuegos to Trinidad takes 1.5 hours. Alternatively, you can drive; or drive. November in Trinidad sees daily highs of 34°C and lows of 22°C at night. On the 24th (Fri), wrap the sightseeing up by early afternoon so you can drive to Camaguey. Get in touch with nature at Coco Beach and Rancho King Touristic Farm. Explore hidden gems such as Plaza del Carmen and Galeria Martha Jimenez. There's much more to do: steep yourself in history at Plaza San Juan de Dios, tour the pleasant surroundings at Casino Campestre, pause for some photo ops at Camaguey Centro, and view the masterpieces at Casa de Arte Jover. To find reviews, photos, ratings, and other tourist information, read Camaguey travel planner. Drive from Trinidad to Camaguey in 4 hours. Alternatively, you can drive; or take a bus. In November, daytime highs in Camaguey are 34°C, while nighttime lows are 24°C. Wrap up your sightseeing by early afternoon on the 27th (Mon) to allow time for the car ride to Holguin. Not overly touristy, Holguin offers a different perspective on Cuban life, standing as a major city that doesn't seek to commercialize its past or cover itself in all inclusive resorts. Get some cultural insight at Cementerio aborigen de Chorro de Maita and Museo Casa Natal Calixto Garcia. Get in touch with nature at Playa Esmeralda and Bahia de Naranjo Nature Park. Next up on the itinerary: step off the mainland to explore Cayo Saetia Island, browse the eclectic array of goods at Guardalavaca Flea Market, meet the residents at Dolphinarium, Cayo Naranjo, and get great views at Hill of the Cross (Loma de la Cruz). To find traveler tips, ratings, other places to visit, and other tourist information, read our Holguin trip planner. Drive from Camaguey to Holguin in 3.5 hours. Alternatively, you can drive; or take a bus. In November, daytime highs in Holguin are 34°C, while nighttime lows are 23°C. Finish your sightseeing early on the 1st (Fri) to allow enough time to drive to Santiago de Cuba. On the 1st (Fri), step into the grandiose world of San Pedro de la Roca del Morro Castle, explore the different monuments and memorials at Cementerio Santa Ifigenia, then steep yourself in history at Moncada Barracks, and finally cruise along La Gran Piedra (The Big Rock). Get ready for a full day of sightseeing on the 2nd (Sat): stroll through Cespedes Park, then take in the spiritual surroundings of Cathedral of Our Lady of the Assumption, then make a trip to Casa Museo Granjita de Siboney, and finally take in the architecture and atmosphere at El Cobre Basilica. To find traveler tips, more things to do, other places to visit, and more tourist information, you can read our Santiago de Cuba trip builder. Getting from Holguin to Santiago de Cuba by car takes about 2.5 hours. Other options: drive; or take a train. Expect a daytime high around 34°C in December, and nighttime lows around 24°C. Wrap up your sightseeing on the 2nd (Sat) early enough to travel back home.